Registration for summer programs is now open! 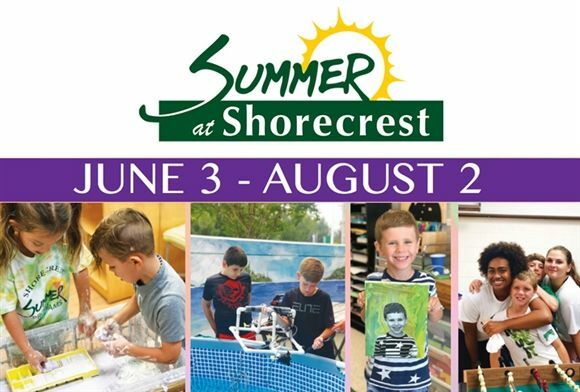 Summer at Shorecrest offers camps, programs, and classes for students age 4-years-old through high school; there are even offerings for parents this summer! Summer at Shorecrest runs June 3 - August 2. Half-day specialty camps, full-day recreational camps and travel opportunities are available. Registration for Summer at Shorecrest is open to the community - we welcome Shorecrest campers to bring their friends and neighbors! Visit www.shorecrest.org/summer for full descriptions, schedules and registration. Play Performing Arts, who brought The Wizard of Oz camp to Shorecrest last year, is offering four camps this year: Wizard of Oz, Alice in Wonderland, Disney Through the Decades, and Songwriting. Check the summer programs list for these new additions!